The new 2011 model NordicTrack C900 treadmill is going to be a big seller for NordicTrack. It is one of the most value-driven models under $1000 you will find on the market today. The NordicTrack C900 treadmill has a 7" backlit display which tracks your speed, time, incline, distance, pulse, and calories burned. With 20 pre-set workouts, you can choose from 5 high intensity, 5 speed, 5 incline or 5 calorie-burn workouts using simple navigation. *iFit ® Live wireless adapter sold separately. UPDATE: The C900 treadmill has been discontinued, replaced by the all new NordicTrack C990 treadmill which is iFit enabled, has more workouts and other great features. A definite upgrade. The NordicTrack C900 treadmill has it all: durability and power, a quiet tread belt on a big 20" x 60" deck, one-touch controls for speed and incline adjustments, 350-pound weight capacity, built-in sound system featuring 3" high-excursion drivers, heart rate sensors in the handlebars, a fold-up deck design, and a 3-speed workout fan. The 3.0 CHP motor is dynamically spin-balanced and designed to deliver superior performance in vibration and noise. The air-based, shock absorbing system has four points of cushioning for added comfort. 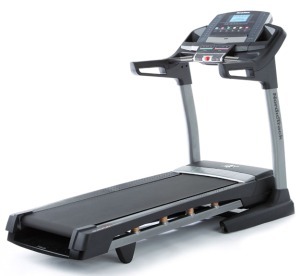 NordicTrack builds only 3 or 4 treadmills at the $1000 level, including this C900 model, and they are exceptional. 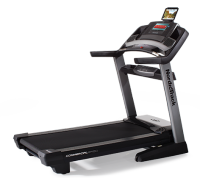 The NordicTrack 1500 treadmill has been very popular for a couple of years now and the C900 is comparable to it in specs and features. The early treadmill reviews on the C900 by equipment pros are enthusiastic as people frequently remark on the excellent value this model offers for the price. Forget the MSRP of $1299, the NordicTrack C900 can often be found online on sale for $999. At the sale price, this runner’s treadmill is a better deal than the NordicTrack A2750 Pro at $999 because of a larger motor, steeper incline, and the new advanced cushioning system. This new generation of NordicTracks delivers, offering big value, decent warranties, better parts, more power and cushioning, and a more attractive console. Unfortunately, the customer service is still lacking but Rome wasn’t built in a day. The NordicTrack C900 treadmill is a Good Buy.